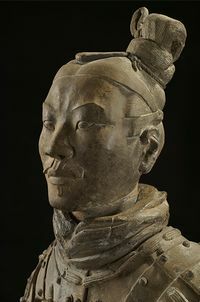 The exhibition will feature approximately 120 individual objects, which include terracotta figures of warriors, arms and armor, ritual bronze vessels, works in gold and silver, jade ornaments, precious jewelry, and ceramics, all drawn from the collections of art museums and archaeological institutes in Shaanxi province, China. Dating from the Pre-Qin period (770–221 BC) to the Qin dynasty (221–206 BC), these works of art, excavated from the emperor’s mausoleum, as well as aristocratic and nomadic tombs, will represent history, myths, and burials in ancient China. The exhibition will explore the following themes: the birth of the Qin empire and cultural diversity in ancient China; the First Emperor and unified China; and the quest for immortality. Through presenting rich archaeological finds, the exhibition will provide a glimpse into the ongoing excavations and research, which continue to shed new light on the Qin culture and the First Emperor’s burial complex. Exhibition organized by the Virginia Museum of Fine Arts and the Cincinnati Art Museum, in partnership with Shaanxi Provincial Cultural Relics Bureau, Shaanxi Provincial History Museum, Shaanxi Cultural Heritage Promotion Centre, and Emperor Qin Shihuang’s Mausoleum Site Museum of the People’s Republic of China. This exhibition is supported by an indemnity from the Federal Council on the Arts and the Humanities.